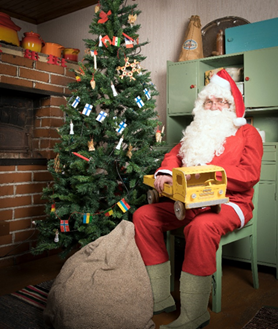 Learn how Finns celebrate Christmas, meet Santa Claus and enjoy a traditional Finnish Christmas menu! The programme will take place at the Kempele local museum, Kirkkotie 18. The museum is a typical Finnish farmhouse from 1886, and the atmosphere is magical. You will get a warm, memorable experience that brings back childhood memories, and you will learn about the mindset that Finns used to have in the old days. Arrival at the Kempele local museum, Kirkkotie 18. The museum is in the centre of Kempele and it is easy to reach by car, bus or train. Ask also for taxi service. Introduction by a guide to the museum, Finnish Christmas traditions, programme during Christmas Eve, food culture, preparations, gifts and history. Enjoying a traditional three-course Finnish Christmas menu or Christmas porridge or Christmas cookies. Meeting Santa Claus and getting small presents. Price depends on the size of the group. Group sizes 10-20 persons. 2 hours programme with menu available from September until April.